Semester 1 2010 is now in the past. This Semester tested us further then all others. Not only were we working in groups, which brings its advantages and challenges, but our site was at a larger scale then we have worked with before and was largely inaccessible being in Canberra – a bit too far away to be able to go back and check things. Only one dedicated group managed to return for a second site visit. Our originally light rail-driven-design developed further in the last few weeks of design. The high density development remained anchored by the light rail but became organised, in an abstract way, by the green corridors that run throughout, connecting the surrounding and existing open spaces. Out master plan shows how these ideas were implemented. These open spaces were to represent the different degrees or nature from the wilderness to man made in relationship to the surrounding areas. We zoomed in on two parts of the green corridors to look at in more detail. This allowed us to get back into a scale we were comfortable with. This is an example of one of our zoomed in parts. I’m glad to say that all the groups made it through with no friendships lost, which we hear has happened other years. And our professor put this down to our ‘lovely class spirit’. Working in a group of four took some pressure off as we had four times the power to get the work done. Our group ended up almost living together at one of our houses towards the end in order to get the work done. We survived the late nights and long days by listening to music and episodes of Arrested Development. We presented our work as a group, each talking about the aspects of the design we felt we knew best. We were happy with how it went on the day but mostly relieved it was all over! Until next time! The final chapter- semester 2 2010. I remember feeling particularly exuberant on my first day back at uni this year; perhaps, it was because I had survived the onslaught of assignments and exams for two years now, finally arriving at the half-way point. But just as how the effects of coffee never last, this enthusiasm had more or less fizzled out by the end of the week. The prospect of having to deal with more complicated design problems in the context of realistic engineering methodology (yes, we actually need to create designs that work now!) was a little overwhelming. Two years into the study of landscape architecture, but I still feel as though I know too little about it. Yet, as I gave the issue more thought, feelings of despair were gradually being replaced by a calming satisfaction—I am more certain now that I had made a right choice to study Landscape Architecture. Don’t get me wrong—I am no masochist; It’s just as how a tutor of mine once said, “If your brain doesn’t hurt, then you are wasting your time because you aren’t learning anything new.” I’m certainly glad that despite two years into the course, Landscape Architecture is still as, or perhaps, even more intriguing to me than the very first day. The past summer was probably testament to that. I spend the bulk of my holidays gaining some industry work experience at a range of places—and again the breadth of Landscape Architecture simply blows my mind. I worked at Randwick council nursery for a couple of weeks, where I learnt basic horticultural techniques of repotting, transplanting etc. These might seem boring to some but definitely not to me—after all, having had lived in high-rise residential blocks all my life in Singapore, I never had a chance to pick up such skills! 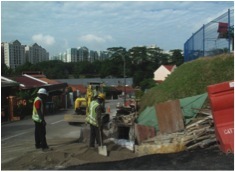 When I headed back to Singapore, I was also attached to a civil engineering firm for a couple of months. Whilst my daily companions were a camera, pen and measuring tape, it was a highly engaging time for me too. Comparing plans with the actual work site might be tedious at times, but it definitely brought a whole new practical dimension to all the studio work I have been participating in at uni. Of course, a holiday would not be any fun if it was all about work, so I went on a couple of family trips to Taiwan, Hongkong and Macau. Perhaps knowledge opens one’s eyes to be more aware of one’s surrounds, (or maybe I was just more alert now that I was less sleep deprived), I began to realise and appreciate the landscapes these cities had to offer. 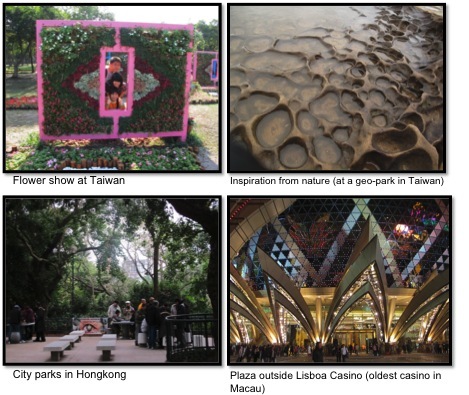 The national parks at Taiwan, the casinos (theme-park like) landscapes and the vibrant urban scape of Hong Kong all became sources of inspiration for me. 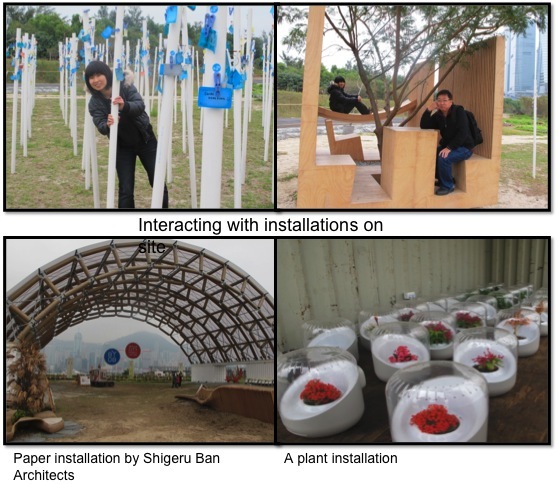 In Hong Kong, I also had the opportunity to explore how other designers thought and expounded on their ideas directly when I visited the “2009 Hong Kong & Shenzhen Bi-city Biennale of Urbanism \ Architecture”. 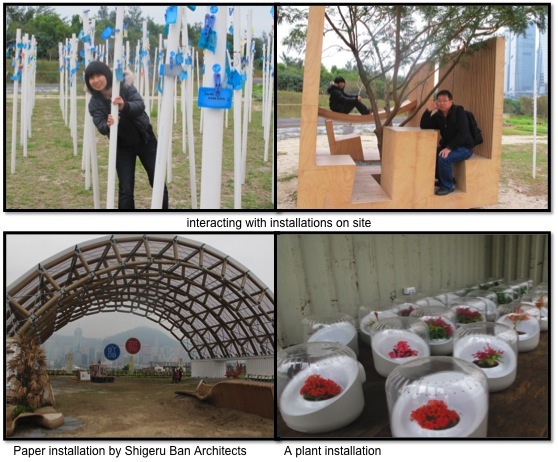 All their works (including an installation by the famous Shigeru Ban Architects) were exhibited across a waste field at the lesser known edge of the Kowloon waterfront. Though at first glance, the place was aesthetically unappealing, it retained a mysterious aura which fueled my curiosity about the site (which reminded me a lot of the 2008 Sydney Biennale held at Cockatoo Island). It was certainly an eye-opening experience, fun too, as I frolicked and interacted with the designed installations—to me, that’s what design ought to aspire towards. Having had been taught that landscape architects design places ultimately for people (and not self-glorification or aesthetic purposes), it is certainly a great reminder that a design cannot be judged by its cover. Essentially, it is all about what it has to offer for people to feel comfortable in, for people to interact with, in order to derive a better quality of life. Now I remember the real reason why I was feeling partly exuberant on my first day back at uni. Not so much that I had survived the stressful times, but really because I had a great holiday applying all that I had learnt over the past two years (consciously at times, but more often than not, subconsciously appreciating this fabric of life). I just can’t wait to see how the coming year would change my life like the last two did! Hey Everyone! It’s Ali here again. Well I’ve just had my first few weeks of my final year of Landscape Architecture. I think it’s going to be pretty hectic. For our design Studio this semester our site is in Canberra. This means a 4-day field trip down to our nation’s Capital to get acquainted with our site which should be fun. We’re going to be looking at a large area to the east of Canberra for development. 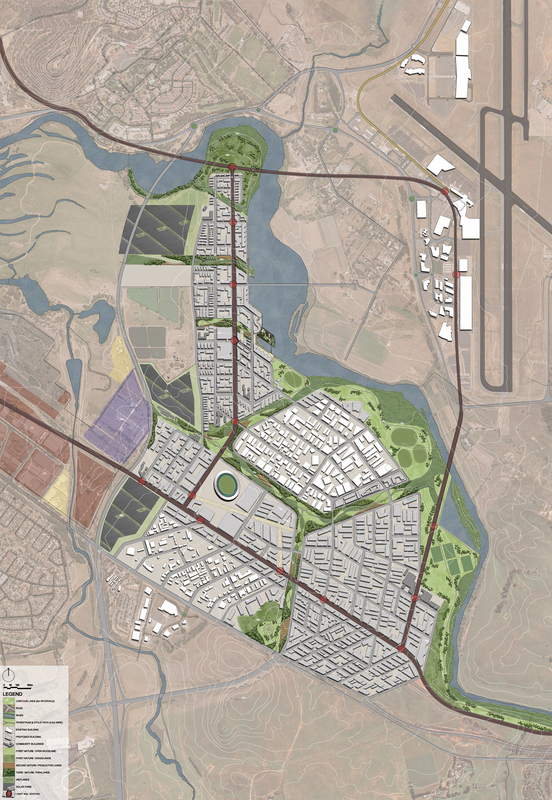 This area includes Canberra Airport and Defense lands so it will be interesting to see how we can incorporate these land uses into our designs. Just to make it more difficult the whole semester’s work is in groups. If group work goes well it can be amazing- but it can also go very badly. We got to pick our groups ourselves so I think our group will work well together. We’ll have to wait and see. I’ve also decided to write a thesis this year instead of doing more electives. I’m going to be researching urban agriculture – i.e. 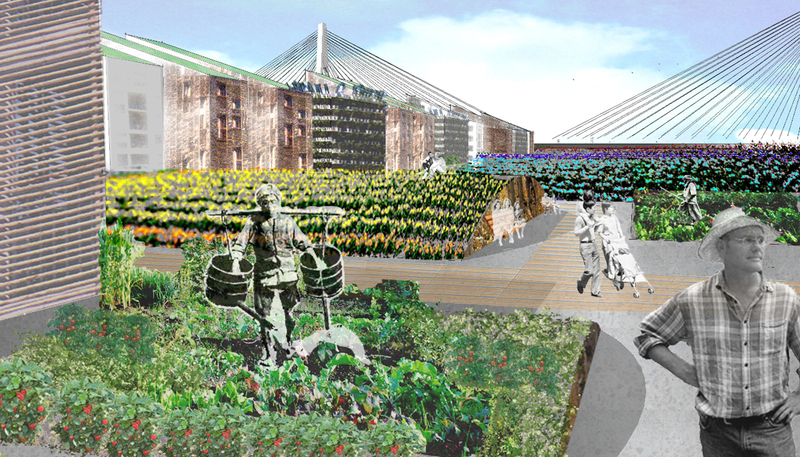 growing food in our urban environments, closer to where we live. I had my first meeting with my thesis supervisor yesterday and let’s just say I have a lot of work ahead of me! 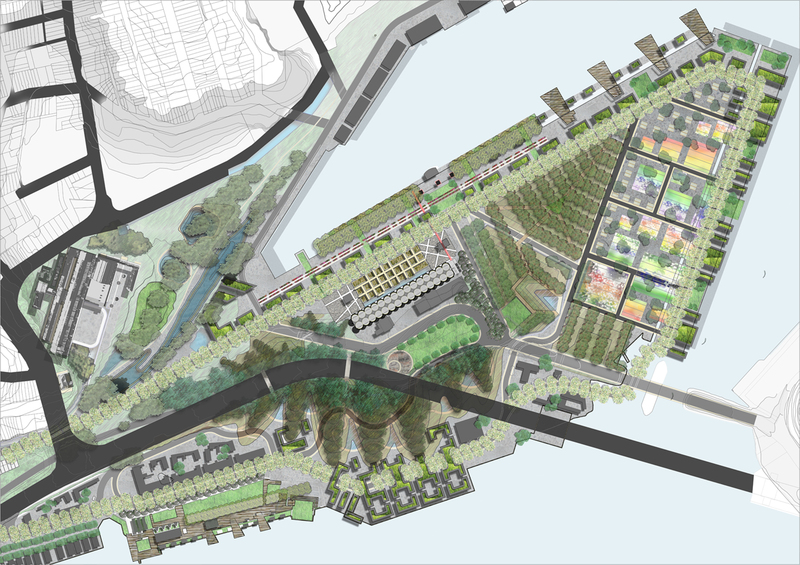 The project connects and rejuvenates­­­ Glebe Island from a neglected post-industrial landscape into a valuable component of the urban landscape. 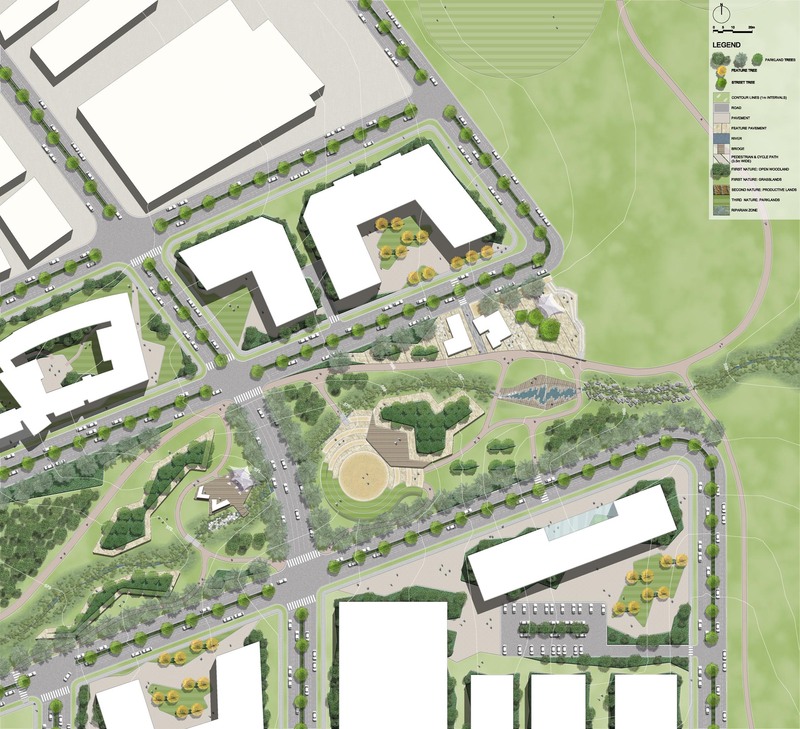 Instead of the passive design approach to reclaim post-industrial landscape into an ecological precinct, these proposed reclaim site should make greater use of its perimeter and become a metropolitan attraction that brings users deep into the space. Moreover, Glebe Island will be the frontier to compensate for the urban development that is disturbing the equilibrium between the Sydney’s market gardens and its green spaces that support the urban context. Hence, Permaculture design principle was present to resolve this disruption of the human support system. The Newly established human support system, will focus on a complex design process looking at water, topography, vegetation and anthropology at different stages that result in a fusion design which highlight the contrast between the industrial and natural landscape. As a result the outcome will be successful to create a lively connection between the Park & City by relating Glebe Island as a catalyst to meet its goal for Sydney to become a sustainable city by 2030. Indeed, in the process of designing nothing, the realisation that nothing is essentially everything started to dawn upon me. Not only did this knowledge empower me to consider the design of my designated site, Shrimptons’ Creek Parklands, in a more holistic manner, it also implied that every single experience of life in and out of the classroom was highly valuable in informing my design. This certainly helped me to appreciate all of life’s joys and drudgeries. Working at Gardens-R-Us (as part of my work experience) is certainly a case of point. The first few days of work were so physically demanding that the minute I got home, I crashed into bed. It was, after all, a very labour intensive job, which required the rearranging pots of plants, raking, heavy lifting work when deliveries arrived (which happened too often in my opinion! ), weeding, price labeling and so on. In light of this, there were times I dreaded going to work. Just when I thought that I had nothing to gain from this experience but a weekly workout, I started to realise that I had subconsciously become more knowledgeable in plants. I remember that sense of satisfaction that filled my heart when I could identify one of the plants being discussed in studio; a great improvement indeed, considering how the only plants I ever knew were those that were found in my dinners! In hindsight, I do realise the significance of being aware of plants and how to manage and handle them even though having direct contact with them was never really part of the job scope for landscape architects. This knowledge is pivotal in making my designs more workable and successful in reality– A worthwhile experience indeed. Time does not permit me to dwell too much on the wealth of information I have also gleaned from other lessons in history, computing and life in general but I can assure you that with this new found awareness about the work content of landscape architects, even the mundane act of eating can act as a source of design inspiration. Before I bore any of you further with more words, here are my final presentation boards presenting my proposed solutions for Shrimptons Creek Parklands, a leftover space. I look forward to another year of challenges, for, despite having a knack of making me exhausted, they certainly spur me on in my pursuit of being a landscape architect who is truly aware and capable of designing something as abstract as nothing-ness. Hi there again guys! This semester passed like a flash—as expected! While I had a slow start to the semester, it wasn’t long before that buzz of activity which I had been so accustomed to in my previous year, started to set in; Not to the extent that it was unbearable though, but rather, that it added that needed bit of adrenalin to my life! This semester consisted of two main studio projects. 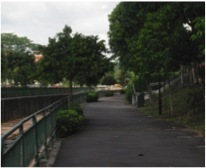 The first site of consideration was at George’s Heights (as mentioned in my previous blog entry), where we were tasked to design a path that would enhance the experience of a visitor to the park. Below are some images of the drawings that I produced for this project. To keep it brief, I would sum up my learning point from this studio in a word: CONCEPT. Every successful design must have intent even in its desire to remain subtle about the concept it is based on. This means having a strong concept that can be easily understood and enjoyed by any user of the park (i.e. ordinary man on the road) without having to be too blatant about it. In light of this, I felt that the concept of “deconstructing boundaries” was especially apt, since instead of delineating specific paths per se, I deliberately created landscapes that suggested them. In that manner, people define their own paths and perhaps, through that, could derive a richer experience from journeying through this site. The other studio project was based in Sydney Park where we were expected to consider how we might redesign the south west corner of the park to include a sports centre, an arts centre, or a sustainable village. Again, my knowledge of another word is enriched through this studio: CONTEXT. This project not just required one to come up with a strong concept with programs supporting this, but also to do so with respect to the context (cultural, physical, environmental, historical etc) to justify this. Context had to be considered on several levels, be it the suitable programs in the redesigned area itself to support the main center, the southwest corner with respect to the whole park, or the whole park and how it sits in the wider scheme of things (i.e. in the city of Sydney). 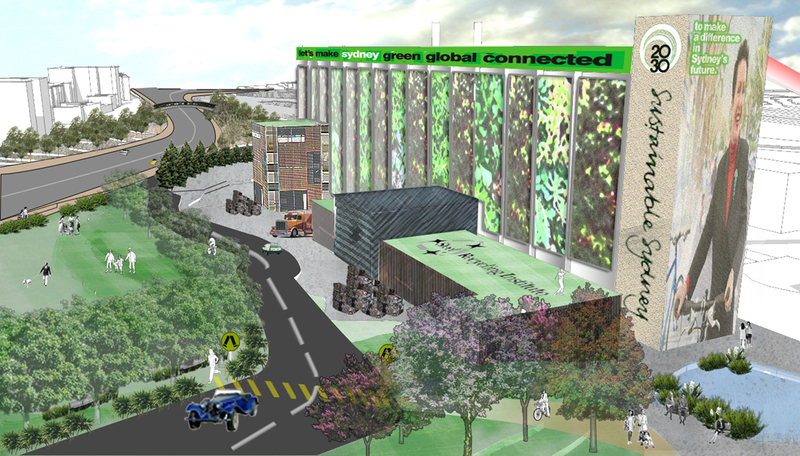 Below, the final panels narrate a story of connectivity and sustainability from the known history of the site to the future proposed design plan for Sydney Park. All in all, I have come to learn, both in theory and studio that design really is a social act— where the needs of people ought to take precedence over the aesthetic considerations for the site. This presents to me a whole new set of challenges that I’d never needed to consider before, which is, how I might retain a creative design response within a practical and highly disciplined framework. However, speaking from experience, once you see past the restrictions that these considerations pose, it has been highly liberating in terms of the knowledge I am now equipped with, as well as my ability to articulate my ideas and concepts. Hi there, my name is Hollie and I am in my second year studying Industrial Design. I’m currently designing a chicken coop for urban gardens and backyards. The coop is to be mass-produced and retailed as a flat pack. I am not only learning about design and materials, but also chickens and urban perm culture. Two years into the course and I have already learnt so much about the principles of design, engineer software programs such as AutoCAD as well as Adobe Illustrator, product design drawing, material experimentation, ergonomics and using machinery in the Industrial Design workshop hub called the Squarehouse Design Lab. The UNSW Bachelor of Industrial Design course expects you to think and design innovatively to improve design solutions for people and the environment in any product field. But most importantly I think this course is about passion. It’s a lot of work and long nights but at the end of the day, you have to love what you do and do your very best. Soon I hope to learn more about material technology and how this can be manipulated for product solutions. But on an exciting note, I can’t wait to travel on exchange to experience design education at an international level. I am thinking of going to Italy, Sweden or Japan. I studied Design and Technology throughout high school and enjoyed exploring my interests in design, materials, and creating things. All this came to fruition in my year 12 major design project, Pudzzle, which was exhibited in the 2007 NSW ‘DesignTECH’ exhibition in the Powerhouse Museum. Puddzle is an ottoman that transforms into an armchair with adjustable legs and armrests. Concept design, development sketches, discovering inspiration, making endless prototypes, seeking out manufacturers and talking to a wide range of designers about the project – are aspects of the design process that made my year 12 challenges personally worthwhile and insightful. On reflection, what I really took away from this project was an appreciation of my ability to create a beautiful product capable of manufacture for any home or person around the world. To see my ideas change and transform from sketches and randomly assorted materials to a real material product – this is what really captivated me to want to learn and become a product designer. My success in this project, as well as other academic and extracurricular activities, helped me to be selected for the first UNSW Nissan Industrial Design Scholarship, the only one in NSW. This scholarship offers me greater flexibility for course studies and paid work, covering HECS, material and software costs. But more importantly, it offers young designers the opportunity to build student relationships with one of the top leading car companies in the world. So far the most exciting part of the scholarship was attending the 2008 NSW MotorShow as part of the Nissan Press Release and their concept car ‘Mixim’. I was able to talk to Nissan design directors and see the latest cars on the market. Here are some of my most recent studio works – a specialised BBQ utensil for a client, an organic shaped plate and cutlery dish rack made of plywood and a Patterns drawing inspired by Escher.